Birth mother 'thought about him every day'. When 46 year-old Bruce Hollywood keeled over with severe chest pains he thought he was going to die. As the highlights of his life flashed through his mind, so did the advice of his adoptive mother. 'You should find your Japanese mother,' she often told him before she died. The chest pains were the result of a clogged artery and after corrective surgery Bruce decided that it was time he took his adoptive mother's advice. With a little help from Japan's ambassador to the United States, Ryozo Kato, mother and son were soon reunited. 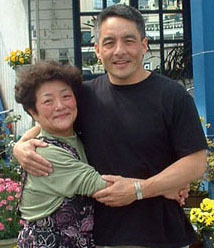 Bruce's birth mother 65 year-old Nobue Ouchi, met his biological father — also in the U.S. Air Force — in Shizuoka, Japan. When he left the country, Nobue says, she didn't realise she was pregnant. Concerned that a mixed-race child would face prejudice in Japan, Nobue allowed an Air Force couple in Japan at the time to adopt her son when he was about 2 months old. Nobue, though, says she always knew she and her son would be reunited someday. She has cherished a letter and picture that Bruce's adoptive mother sent to her several months after the adoption. Nobue, who never married or had other children, opened a restaurant and named it after her son. 'I thought about him every day,' she said. Mother and son met for the first time when Bruce travelled to Japan in April. This week, Nobue is visiting him. Bruce, of Stafford, Va., says he has lived a 'fairy tale' life. He played high school football and was president of the student body, married and has two children. He does strategic planning for the Defence Department. Even though his adoptive mother often urged him to find his biological mother, Bruce didn't feel the need until that day that he thought he was dying. At that moment, he wanted to thank her for making his good life possible.